The main sign that a woman is menopausal is the cessation of her periods. Medically a woman is classed as menopausal when she has not had a menstrual bleed for 12 consecutive months. There is a natural decline in reproductive hormones from our 30s as we produce less and less oestrogen and progesterone. In our 40's menstrual cycles change: periods could change in in time period, perhaps bleeding for longer or shorter than the norm and flow can also change, again becoming lighter or heavier than normal. On average, by our 50's our ovaries have stopped producing eggs and we no longer have periods. No matter whether your menopause is natural or medically induced the symptoms and their effects on every day life can be devastating and often leave many women in a state of dispair. Although it’s more common for women in their 40’s & 50’s to be hitting the menopause there are many women experiencing early menopause in their early 30’s, this seems to be more so when periods have started at a young age or there is a history of early menopause in the family. The menopause is not necessarily easy to detect and symptoms can often go undiagnosed when they arise at an early age. It is not unusual for women to be handed anti-depressants without any form of medical investigation and left to flounder in no mans land feeling completely lost. We are taught so much about puberty in early life, why is there still so little understood about the effects of the menopause? It is believed that the hot flashes are caused by a decrease in oestrogen which in turn affects the hypothalamus, the area within the brain that regulates the body's temperature, this causes the brain to detect too much heat within the body and the natural reaction to this is to sweat. We are all different, with different lifestyles and belief patterns and therefor it makes sense that no two women are going to experience the same symptoms throughout their menopause, which of course also suggests that no two people will have the same methods of management.There are many options available to us these days, we no longer have just HRT to rely on. There are potions and lotions, supplements, holistic therapies, nutrition, gadgets and gizmo's as well as the HRT option. For many women like myself, diagnosis of hormone related cancer means that HRT is not an option when it comes to dealing with the menopause. I have tried many avenues, some have worked well, others not so well. My understanding is that HRT is not frowned upon quite as much these days, and many women have great success with it, but my suggestion would be not to use it as a stand alone treatment, use it alongside holistic therapies so that when you do stop taking the medication and some of the symptoms are still there, you have something to fall back on....mindfulness, hypnosis and self-hypnosis, yoga & meditation, acupuncture, reflexology & exercise are just some of the ways to combat the symptoms of "the change". I am afraid Ladies, this rule still applies with the menopause. Certain foods can indeed aggravate the symptoms, and there are others that will support your body. Soya based & oestrogen rich foods can be supportive of the digestive system and be helpful method of controlling the symptoms. Remember it is important to get the balance right, too much or too little oestrogen can cause problems. It is important to consult your GP if you are concerned or want further advice. Progesterone normalises blood sugar levels, increases libido, is an anti-depressant, helps use stored fat for energy, normalises blood clotting and more. 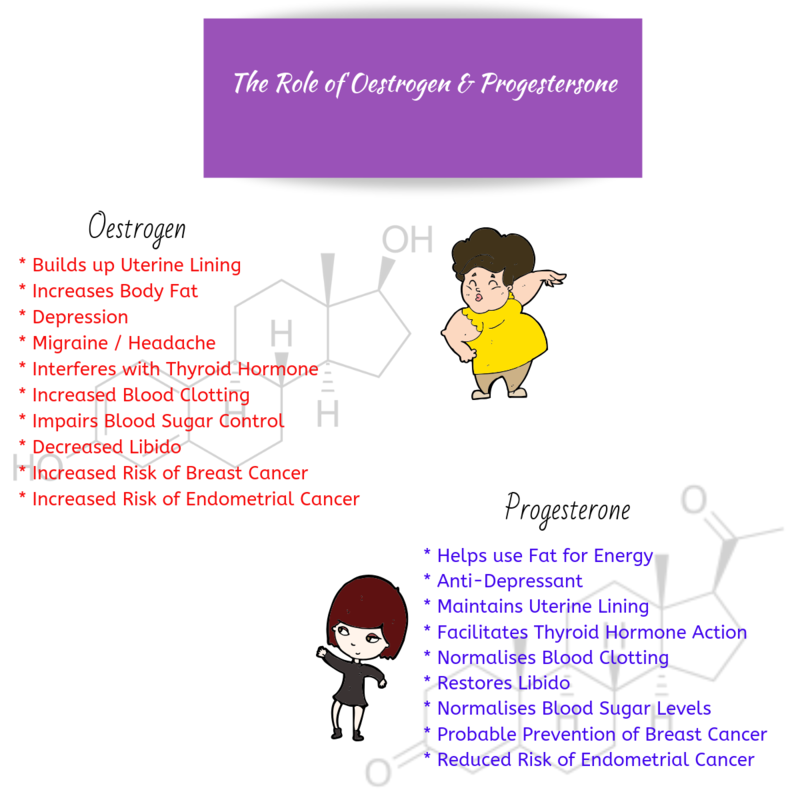 So when thinking about the oestrogen balance is worth paying attention to the progesterone rich food in your diet too. Vitamin B6 is needed to produce progesterone as is Zinc, and Magnesium helps to keep the hormones balanced. n.b. these symptoms are not exclusive to to low progesterone, so if in doubt always check with your GP or other medical professional. Women have much lower levels than men of testosterone, these levels are also lower that that of the oestrogen and progesterone. These levels drop off further in post menopause. Testosterone rich foods are regularly, but not exclusively, rich in Vitamin D, shell fish, red meat and varying beans. 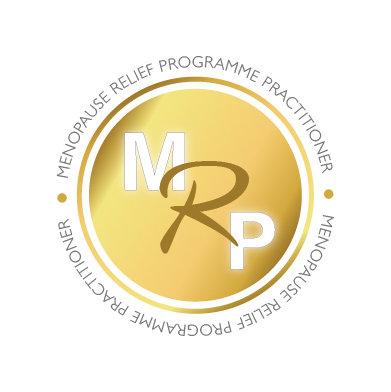 has been designed to help you to manage symptoms of the menopause without the use of medical intervention through the use of hypnotherapy techniques along with additional nutritional hints and tips .